← Future warming in Europe? Global Warming for US & Canada ? The above animation shows decadel averaged temperatures for Norh America as calculated by the GISS-E2-R1_r1i1p2 model for RCP8.5 emissions scenario. GISS-E2 is my favoured model because it best reproduces a fit I made a year ago to HADCRUT4 (see below). The next plot shows 31 CMIP5 models compared to HADCRUT4 (black points), the fit shown in red and GISS-E2-R in blue. 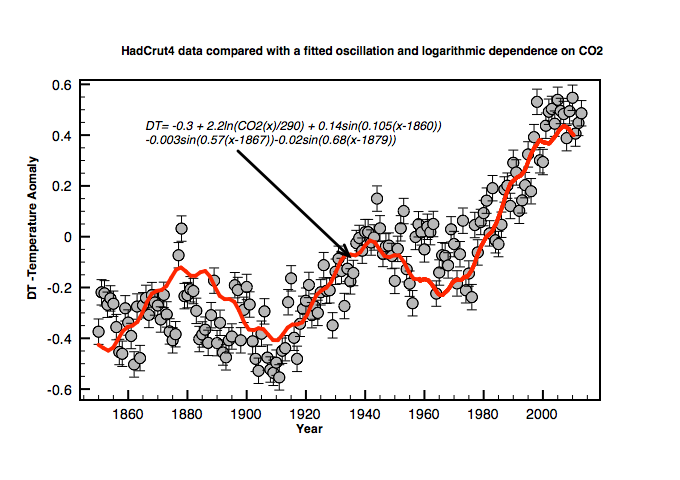 The original fit was made to a logarithmic temperature dependence on CO2 (Mauna Loa) superimposed with a 60y natural oscillation. The details are given below. This entry was posted in AGW, Climate Change, climate science, GCM, Institiutions, IPCC, Science and tagged AGW, Climate Change. Bookmark the permalink. 4 Responses to Global Warming for US & Canada ? There is recent scientific, political and public debate regarding the question of whether the GMST difference between simulations and observations during the hiatus period might be a sign of an equilibrium model response to a given radiative forcing that is systematically too strong, or, equivalently, of a simulated climate feedback at that is systematically too small (equation(2)). 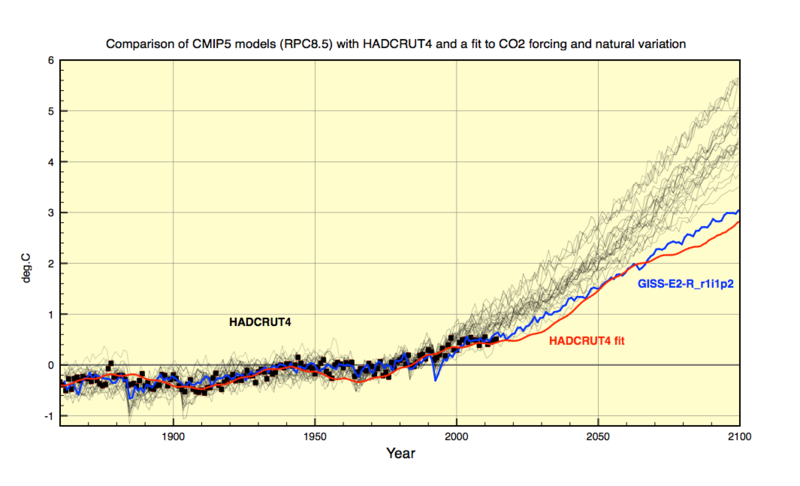 By contrast, we find no substantive physical or statistical connection between simulated climate feedback and simulated GMST trends over the hiatus or any other period, for either 15-or 62year trends (Figs 2 and 3 and Extended Data Fig. 4). The role of simulated climate feedback in explaining the difference between simulations and observations is hence minor or even negligible. By implication,the comparison of simulated and observed GMST trends does not permit inference about which magnitude of simulated climate feedback—ranging from 0.6 to 1.8Wm in the CMIP5 ensemble—better fits the observations. Because observed GMST trends do not allow us to distinguish between simulated climate feedbacks that vary by a factor of three, the claim that climate models systematically overestimate the GMST response to radiative forcing from increasing greenhouse gas concentrations seems to be unfounded. Climate feedback is defined in the paper as alpha (a) in the equation a = F2/ECS where F2 is the radiative forcing of a doubling of CO2 (defined by the individual model, ranging from 2.6 to 4.3) and ECS is the equilibrium temperature change from that forcing over hundreds of years (varying by ocean uptake kappa). M&F argue that because alpha varies from model to model by a factor of three without markedly affecting trend in T shows that climate sensitivity does not matter, and thus its systematic overstatement does not matter, and thus can not be the cause of model deviation from observed temperatures. This seems utterly absurd. Or, what am I not understanding? It is of course it is nonsense that different models with different climate sensitivities produce the same warming trend. That is simply untrue. They are the cavalry sent to rescue the CMIP5 models from the worrying ‘pause in warming’. Thanks Clive. I am in the middle of a debate with Anders aka ATTP on the meaning of that final paragraph in M&F15. Should not the alpha term in the M&F energy balance be the reciprocal of climate sensitivity? M&F put in the numerator of alpha the forcing for doubling of CO2, (F2) which almost cancels out ECS, making the alpha term near unity. Is this possibly why they found alpha to have no traceable effect? If so, is this possibly the long sought circularity? And if F2 is supposed to be in the numerator cancelling out ECS in the denominator how can M&F use the untraceable of alpha to conclude anything about ECS over-estimation?